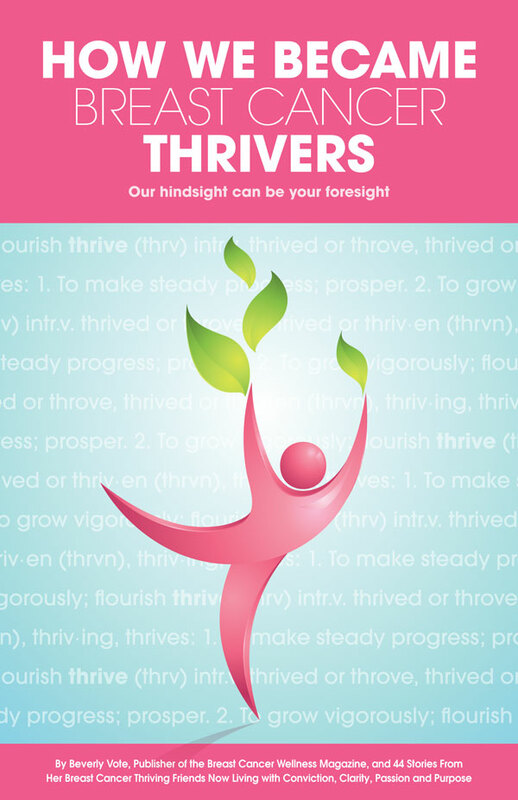 How We Became Breast Cancer Thrivers is a FREE e-book. It was edited and published in October 2010 by Beverly Vote, publisher of Breast Cancer Wellness magazine. Note: To get the very easy-to-read PDF version of the book, click on the link above and then fill in the form and click on Submit. The book consists of essays by 44 contributors, including Beverly Vote. All the contributors are breast cancer survivors. They have written these essays to tell others how they went from feeling frightened and helpless to living lives of new power, purpose, and joy. Leonore's 4,000-word essay, "Another Chance at Life," is on pp. 73-79. It consists of a short introductory section and then excerpts from her own breast cancer book. That is Another Chance at Life: A Breast Cancer Survivor's Journey (Norilana Books, 2009; also Smashwords.com, 2010). Leonore and all the other contributors to How We Became Breast Cancer Thrivers much appreciate any help you can give us in spreading the word about the book. Thank you for your interest in this project, and good health to you! Here's something different. This beautiful e-book is completely FREE. All that Beverly Vote, the editor, asks of readers is that they pass it on to others. As one of the 44 contributors to the book, I am happy to help spread the word about it. In her introduction, Mrs. Vote, the publisher of Breast Cancer Wellness magazine, sets out the goals of her book. She tells how all the contributors, herself included, wanted to give back after having been helped so much by others as they fought their battles with breast cancer. They wanted to share with the world the experiences that changed them from feeling scared and helpless to living an empowered life, one filled with conviction, clarity, passion, and purpose. Many of the women we meet here were inspired by their own experiences with breast cancer to go on to work with others who are suffering the same trauma. We meet motivational speakers, authors, workshop leaders, and life coaches. Others work as fitters of mastectomy bras and breast forms. One is a singer. One is a professional makeup artist. One is an Air Force veteran. The vast majority of them are wives, mothers, and grandmothers. In short, there are women here with whom virtually every reader can identify, whether or not she (or he) has also had breast cancer. Breast cancer freed many of these women from old, inhibiting patterns of thinking, allowing them to find their true and better selves. Some of them divorced their husbands and then found new and more supportive partners. Even more of them found new professions. There is lots of optimism and joy here, and plenty of good advice. But there is also honest talk about the negative emotions that cancer brings with it, such as fear, anger, and a sense of betrayal. Other tragedies are mentioned, too: deaths of spouses or parents, and even the death of an only child. The book is certainly not exclusively about sweetness and light. The lovely entry by Peter Flierl is called "How to Help Your Wife Thrive." He offers excellent and very compassionate advice for the partner of the breast cancer patient. The kindness he evinces is echoed throughout the book, as woman after woman tells not only what experiences and activities brought her back to hope and optimism after her initial fear and physical suffering, but exactly what she is doing now to help and inspire others. Most of the contributors gratefully acknowledge the life-saving aid that traditional Western medicine afforded them. Some mention supplemental healing methods, such as massage, acupuncture, or exercise. Many speak of journaling. Some are long-term survivors who are pretty much past their fear of recurrence of cancer, but a few are not very far out at all from their diagnosis and treatment. Yet they remain hopeful and eager to help others. I hope you will read this book and then tell others about it. Its healing, inspirational messages deserve to be spread far and wide.